In order to take my place in the hop, I also have to tag three other writers, who will post their thoughts on the writing process later in the month. I was hoping to feature writers from the huge literary base here in Winnipeg, but most are so busy or too ill to participate, so I turned to my on-line writer friends. You can read their bios at the end of this post. I was asked four questions, which I will attempt to answer as concisely as I can. My son designed the cover. Cool, isn’t it? Currently, I am in the process of getting a chapbook produced with my writers group. It is an anthology of short stories about the Sasquatch, interspersed with poems in Haiku style, as well as reports of Sasquatch sightings collected by our own paranormal investigator and group member, Chris Rutkowski. We’ve also included sketches and photos to round out the content. We should have it ready for sale by the end of June. We are self-publishing through the Expresso Machine at McNally Robinson Booksellers and it will also be available for e-readers. Details to follow in the coming weeks. I have also been accumulating information on Louis Riel to work into a sort of sequel to my other two books, Withershins and Spirit Quest. Revolution (working title) will be set at the time in which Riel took over the provisional government here in Manitoba, 1869-1870. The daughter of the character in my first two books will be travelling back in time to meet him and learn more about how the Métis people fought for their rights within the French/English community known at the time as Red River. My published novels are historically based time-travel novels set in Manitoba’s past. There haven’t been too many other teen novels that I’ve come across that have been set here with that time-travel theme worked in as well, so I think they are rather unique. 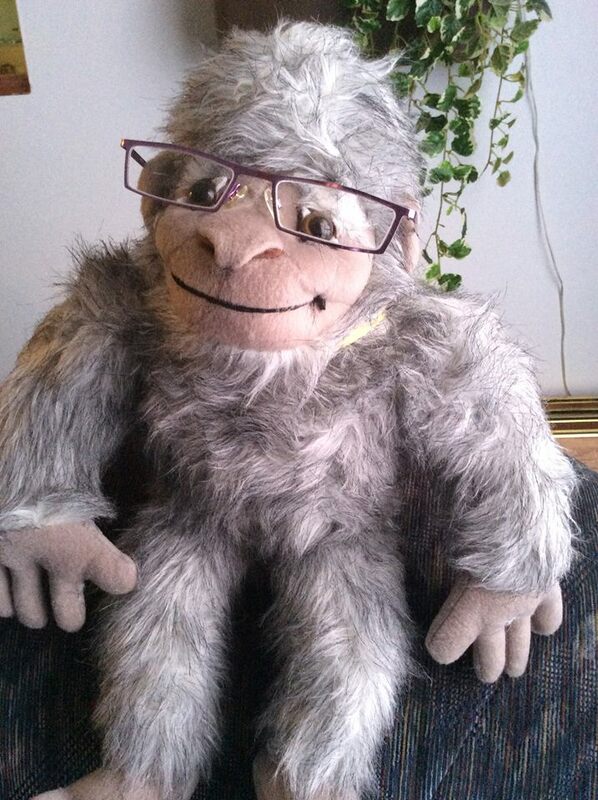 As for the chapbook, my writers group and I decided to write about Bigfoot and the Sasquatch because we thought to get a jump on ‘the next big thing’. Vampires, werewolves, and zombies have been done to death, so to speak, but not much fiction has been written about those huge hairy beasts that peek out at us from the forest. Ironically, there have been recent ‘sightings’ in BC and a local retailer (Two Rivers at The Forks Market) has brought in a truckload of stuffed Sasquatches to sell in his store. (Sassy came from there. She’s cute, isn’t she?) 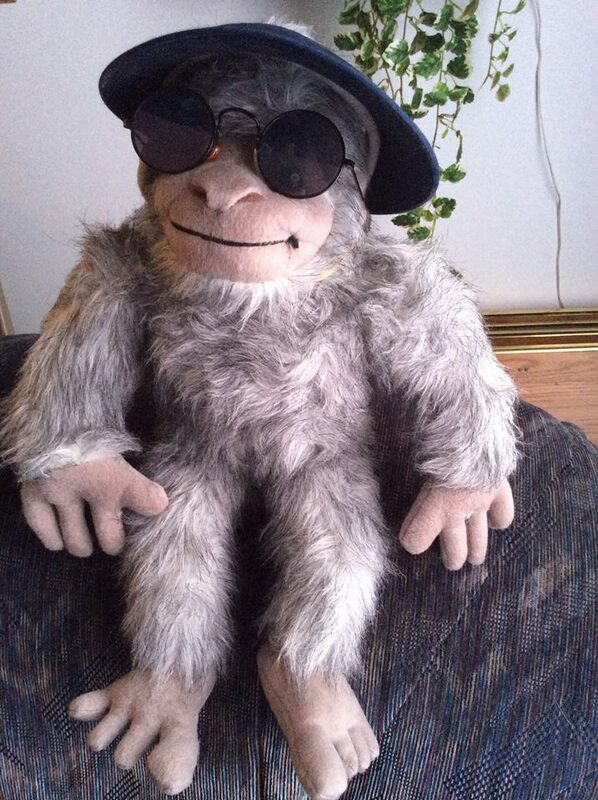 He’s even got a petition to ‘Save the Prairie Sasquatch’, which people can sign when they visit the shop. I think we’re just on the cusp of this wonderful new trend. 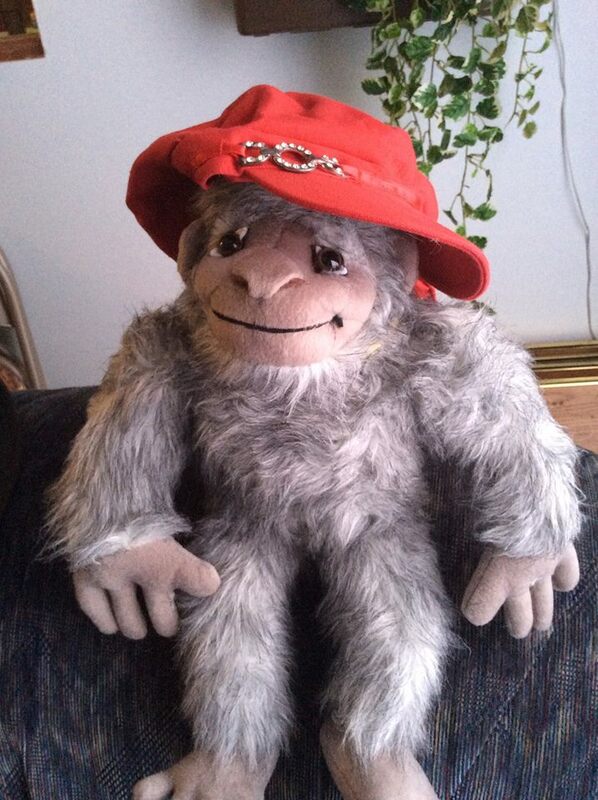 Sassy sporting my red hat. Having an Education background, I want my books to teach kids in an entertaining way. Growing up, I always found history a chore. Trying to link dates with events and historic figures was so difficult for me because I tend to be Mathematically Challenged, a sort of Dyslexia but with numbers. I did like the stories, though. Learning about the people and why they did what they did is fascinating to me. That’s why, when I started writing the first two books in the series, I wanted the story to be historically correct, so readers would get a sense of the time and the attitudes prevalent in the 1800s. Quite often, those who have read Withershins and Spirit Quest comment to me that they didn’t know certain things in Manitoba’s history, so I think my work is done – until the next novel, of course! I wrote the short stories for the group’s chapbook because I’ve got a soft spot for those big-footed mythical creatures. A few years back, I started writing a novel about them, creating a whole history of their existence and why colonies of them live underground, beneath the outskirts of North Vancouver. While the story has yet to find an ending, I still work on it, occasionally, when inspiration strikes. That is not all I write, though. Dreams inspire other stories, (science fiction, fantasy, murder mysteries, etc, both for kids and adults) which I start to write, only because the words need to find paper before the memories melt away with the dawn. I have shelves full of novels and short stories that haven’t been published, yet, and just as many (if not more) that are unfinished, to date. To get at the nitty gritty; why do I write? Teachers used to say I’d achieve better grades if I didn’t daydream so much, so I guess this is something I was destined to do. If the stories don’t get written down, my dreams become more and more bizarre and nightmarish. I write for my own peace of mind! A good night’s sleep is essential because, as I mentioned earlier, so many of my story ideas occur to me in those first few moments before I wake up. I have very vivid dreams and those that have a lasting image for me are often the dreams that I am compelled to write about and form the first few chapters of a novel or become a short story. One dream, in particular, was one I had when I was 16. It haunted me for decades until I finally wove it into a fantasy novel. Unfortunately, my first writers group wasn’t all that impressed, so it’s sitting on a shelf, awaiting revisions. When I was creating Withershins, I wasn’t working. I just had to get the kids off to school and then I would sit down at the computer and write my little heart out! If I ran into a snag, I’d think about it as I fell asleep and by morning my brain had worked out enough details that I could write the next chapter before lunch. If there was something I needed to know for the next segment, I’d head off to the library or archives and research it, then weave that newfound knowledge into a scene with my character. Once a story is finished, however, the work doesn’t stop. Any writer knows that! I must have reworked the beginning of Withershins a dozen times before coming up with the one the publisher liked. Originally, the book was aimed at an adult audience, but my first writers group suggested gearing it to a younger audience. That required some major work because, by then, it was too long for a publisher to consider, so I had to break the book into two novels. That required me to rework the beginning of Spirit Quest many more times until my editor was satisfied with the result. I also needed more research to flesh out the second half of the story. It was a long hard process getting it to the point of acceptance by my publisher. For the chapbook, I thought about the Prairie Sasquatch for days without much inspiration. Then, I mentioned the project to a close friend and her friend at lunch one day. It was suggested I look at the subject from the point of view of the Sasquatch. Brilliant! So that’s how Gemma came into existence. She’s the character I created for the short stories and I have a few more stories I want to tell about her adventures ‘In The Woods’ that will probably meld into a novel for Middle Grade audiences. Well, I hope that gives you some insight into my writing process. While I look for that elusive third writer who will agree to join this blog hop, please check out what these fellow writers & bloggers have to say. I will let you know when they have their posts ready for the blog hop. In the meantime, you can always pop over to their sites to learn more about them. Jennifer M. Eaton has a lot to say about writing on her blog, which can be found at http://jennifermeaton.com. Her blog is amazing – colourful & always interesting. She calls the East Coast of the U.S. her home, where she raises 3 boys when she’s not writing or being a Corporate Team Leader. She has recently had many short stories published by J. Taylor Publishing. C.B. Wentworth has a lovely blog that I’ve been following for about 2 1/2 years. She has traveled extensively and often posts gorgeous pictures of the places she’s visited and tells wonderful stories about her adventures. Sounds like you’ve been very busy! Your next novel about Louis Riel sounds very interesting! And yes, a good night’s sleep is essential! I wish you luck in your upcoming projects! Thanks, Cheri! I wish you luck with your latest project, too! I wish there were more historically based novels that were interesting on a “kid’s” level that were in our schools. My oldest is an avid reader, but he drones on about the required reading at school. Right now he’s complaining about a novel about the Salem Witch Trials. I’d think that would be a cool subject, but apparently the novel is falling quite flat. Good luck with your new stuff! There is a great area pirate love story. A guy fell in love with a rich girl and became a pirate to make enough money to woo her. Unfortunately he killed a lot of people along the way. Ha! One if the museums in Philadelphia featured artifacts from the pirate ship. I actually thought of it as I walked through the exhibit. Such an interesting story. I’m a little too lazy to research as much as this would take, though. I love working history into my stories as well. Whether its true to form or wishful thinking, I like to inspire readers to be curious enough to look things up and discover history for what it truly is – an exciting story! 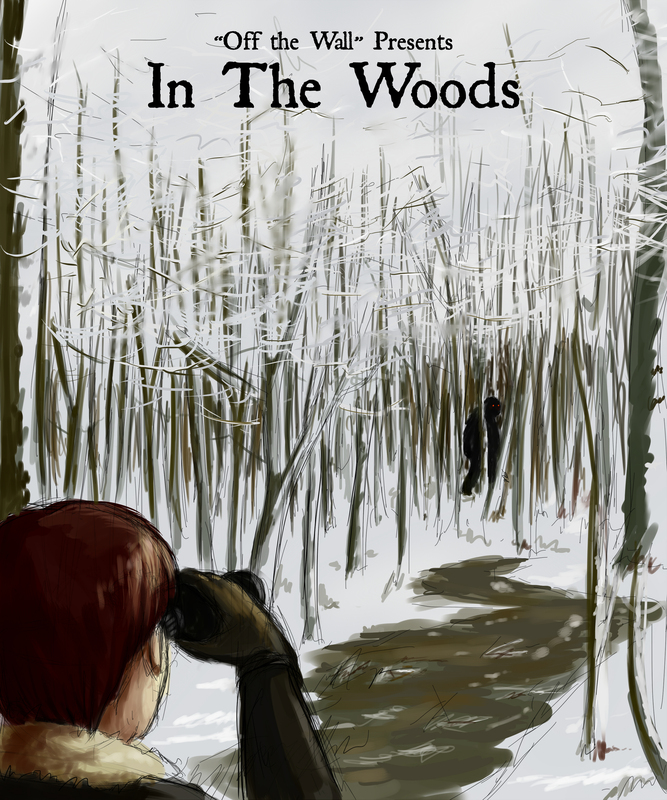 In The Woods has launched!